This was my first hostel I’ve ever stayed at and it was an amazing experience. Great social atmosphere but not over done. All the beds had personal lights, USB ports, and outlets. Free tea at the balcony all the time. Free walking tour that helped you make friends. It made my first few days in Ecuador alone feel like I was surrounded with friends. Highly recommend! I honestly cannot fault this place. Easily the best hostel I've ever stayed in. Staff are friendly and knowledgeable, location is perfect for exploring the old town, rooms are clean and spacious, plus the rooftop terrace bar is absolutely incredible with cheap drinks, great views and an amazing atmosphere. We stayed here one night in the private room on the ground floor, before heading to the sister hostel in Cotopaxi. Room was spacious and comfortable, although you could hear a lot of noise as it's sandwiched between the luggage storage room and the laundry room, plus it's close to the entrance. So bring ear plugs and you'll be ok! Water was hot and WiFi mostly worked. Rooftop bar has a brilliant view. Breakfast isn't free but was pretty good and very cheap. Really happy I stayed in the secret garden. The staff were extremely helpful and friendly. Great atmosphere, great location, tasty breakfast. There are lots of great facilities in the hostel like walking tours etc and they also help you to organise other tours. I will definitely stay here again. Great location and fab staff who create a friendly, fun atmosphere. Stayed a few times while in Ecuador. 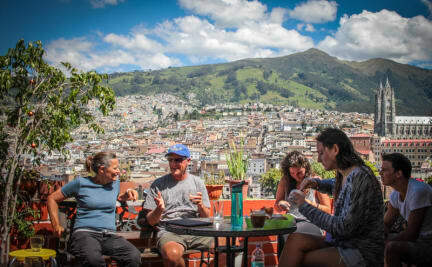 Not our favorite part of Quito, but well located for all those just in town to see the center and then go on elsewhere. The rooftop has a great view and good for chilling/working during the day and meeting people at night. The check-in process is a little annoying (reception is upstairs, signs not immediately clear), but overall staff and volunteers are helpful and would recommend a stay. Basic rooms with a fun backpacker atmosphere on the rooftop. The entrance could be more welcoming (it was a little confusing reception being upstairs). Location is good for the centro historico, but I prefer to spend more time in other neighborhoods in Quito. It's a good spot for a short stay and to meet other travelers. Cool hostel located in old town. Best part is definitely rooftop terrace view and friendly staff, especially Edwin-he's so nice and helpful! Little bit of a pain that the reception and meals are on the rooftop so have to go up 3-4 floors if you need anything, but I guess you get the views then. Hammocks on the ground floor are a cool feature. Bathrooms are tinyy but you get hot water! Room size is okay (not spacious) and felt a bit musty, but beds are comfortable! Would recommend. Overall not a bad hostel, but don't stay here if you want to sleep. The room was right below the bar which closes at 11 really probably 11:30, then around 2am people come back from the bar which is fine if they enforced quite hours but they don't so plan on being keep up by loud drunk people from 2-4. Then at 6:30 they set up for breakfast making enough noise to wake anyone up. When I'm staying anywhere I'm paying for a place to sleep, of which I got 3 or 4 hours here. The rest was ok.